What is the remote service? 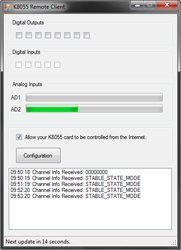 The K8055 remote service is a free service to control your K8055 card over the Internet. The service is an interaction between this website and a special client program that needs to be installed on your local computer. This client program will control your K8055 card. Unlike expected the client program doesn't act as a server program: it doesn't take any incoming connections. Instead it will connect to the remote service once per minute. Then the requests are downloaded and executed on your K8055 card. The remote service is no real-time service! The K8055 remote service has a dedicated website which can be accessed at http://remote.bvsystems.be. You only need to create an account on this website. This account is completely anonymous: you don't need to give a name or E-mail address. You can login after creating your own account. You then will see a page that is similar to the screen at the left. The screen will show you the current state of your card's input & output channels and the time of the last update. 8 checkboxes are allowing you to specify the desired output states of the channels. You can send the request by clicking the 'Send Digital Values' button. Remember the data is not sent in real time. The client program will process the request during the next update cycle (it occurs once per minute). At the bottom of the page you can always see the date/time of the last update. This information allows you to determine if the client program is currently running or not. The client program needs to be installed on your own computer. This program will control the K8055 card. The program has 8 checkboxes to set the state of the digital outputs. The outputs will change as soon as you change one of the checkboxes. It also has 4 checkboxes to indicate the state of the digital inputs. You can't change these checkboxes as they are read-only. There are also 2 progress bars to indicate the value of the analog inputs. These progress bars are showing the actual value of the K8055's 8-bit A/D converter: a number between 0 and 255. So the results are not rescaled to a certain unit (like pressure, temperature, ...). The application will poll the website once per minute. During a poll it will send the current output states to the remote.bvsystems.be site. As a response, the remote.bvsystems.be sends back the (eventually) requested channel outputs. The client will set the outputs accordingly, but only if you checked the checkbox "Allow your K8055 card to be controlled from the Internet". This is a security measure. Why did you build this system? I developed this system as a technical challenge. The system was never meant to use on a large scale. I made this project public to demonstrate the possibilities of the K8055 card. You shouldn't use it for home automation applications. Currently I'm working out a new system to control the K8055 over the Internet. This system will have an optimal security. I don't think this system is hacker-proof. First of all the communication between client and server is done with unencrypted webpages, over an unencrypted connection. These messages could be intercepted. Are the source files available? The source code for this project is not available. Does the program has proxy settings? This software has no proxy settings. It takes the settings from Microsoft Internet Explorer. You can download the client application by clicking the button below. The application comes with a complete setup wizard. You can login (or create a login) at http://remote.bvsystems.be/login. The remote service is a demonstration service. I don't recommend to use it permanently. Nor should you use it for K8055 cards that control critical hardware. To improve security the remote service is completely anonymous: no personal data is collected. The site only remembers the login data and the current state of your K8055 card.